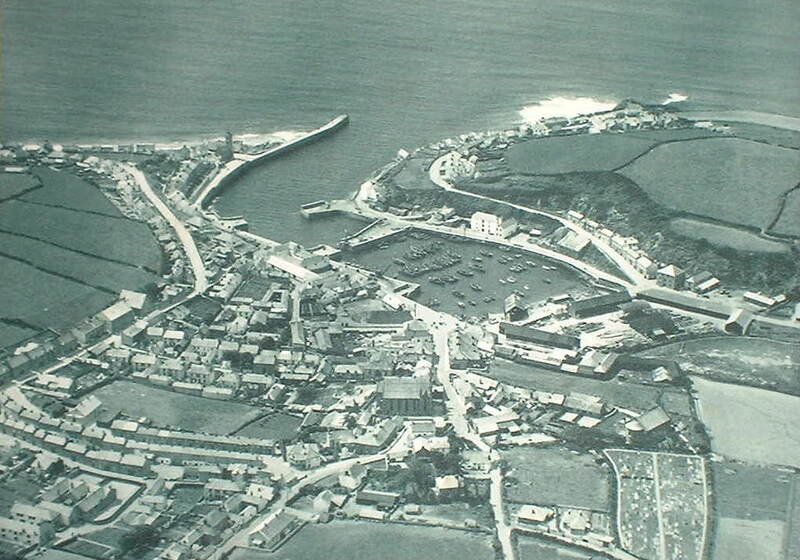 The name “Porthleven” is thought to have been derived from “St. Elvan”, who was a compatriot of St. Breaca, the patron saint of Breage, a nearby village. Earliest records tell that it was a little fishing village nestling in the shelter of a wooded valley of a tiny creek in Mount`s Bay. Here, on the south-west coast of Cornwall, where many an ill-fated ship has been driven ashore by the fury of the Atlantic gales, stood the little struggling village of Porthleven ( or Port Leavan Cove). Far away from the busy world, the quiet fishing cove had inhabitants who were mostly fishermen. Their humble dwellings were tatched cottages with white-washed walls of “clob”. A small stream that followed a winding course through the village divided the hamlet into two parts: Breage-side and Sithney-side; the names indicating the respective parishes. The cottages were neat and clean and gardens at the rear would be seen growing the tamarisk (a withy which was used in making crab pots). Drawn up on the foreshore would be several boats used for crabbing and “whiffing”, and nearby would be the fish cellars where pilchards were cured. At Torleven were two old mills where neighbouring farmers would bring grain. The mills have long since disappeared. The farm houses all had their wide chimney corners, in which peat was burned. A Valued possession was the “chil” (or Cornish lamp) which was an earthenware or metal stand, shaped like a candlestick, from the centre of which rose a stem for supporting the oil container. Fish or train oil would be put in this, the wick being a rush, floating on the oil, and the end resting on the lip of the container. Most of these old cottages have now been replaced by modern houses. At Gravesend (the name given to the easterly part of the village owing to the large number of sailors buried there), are still a few of these old type houses. The inhabitants lived simple, quiet and peaceful lives. The telephone, radio, train and motor transport were unheard of in those far-off days. News from London was brought by an occasional traveller who passed that way. Once a week a newspaper wes read to a number of men who gathered in the fishermen`s loft at Ocean View Terrace. This was the first newspaper in the village. Excitement prevailed on one occasion when a press gang paid a visit to Porthleven, their boat being disguised as a lobster smack. When the fishermen went out to meet them, hoping to sell some shellfish, they were apprehended and two of them were impressed into his His Majesty`s service. After this scare a bell was rung to give warning of the approach of the press gang, but the rope broke on one occasion when a false alarm was given and the bell fell into disuse. Half a mile from Porthleven, reached by way of the Treza Valley or the cliff road at Breageside, is the ancient Methleigh Manor, which can be traced back to the time of the Great Survey of 1066, when it was held by the Bishop of Exeter. Known then as Metela, it must have been originally a portion of the demense of the monastic body which dominated The Lizard peninsula. Its value in the year 1086 was reckoned at a hide-and-a-half. (The land measurement made use of in the Domesday Record was called a “hide” and is supposed to have equalled one hundred and twenty acres). It was to this Manor that the church at Breage was appendant, and it may well have been the demense land of a religious community before the Saxon invasion. The greater part of the surrounding country at this period was wild and uncultivated and sparsely inhabited; and in all probability serfs (slaves) worked on the demense of their lords. Most of the serfs of the manor houses were born in serfdom. Human life was short and cheap. The serfs were compelled to live on the manor at which they were born and to give the greater part of their labour free to the service of their owner. Judged by present-day standards the lives of these poor slaves must have been dull and hard indeed. At this manor the Earl of Cornwall (Count of Mortain) had a yearly market. This was an ancient event, held by Bishop Leofric in the time of Edward the Confessor. Through its connection with Exeter, Metela escaped the rapacity of the Normans. The first Bishopric of Cornwall was established at Methleigh about 1046, but the title of the See was afterwards changed to that of Exeter. Methleigh passed from the hands of the Bishop of Exeter to the Dean and Chapter of Exeter and by them was conveyed soon afterwards to the family of Nansladon. From the Nansladons it passed into the hands of the Chamonds family, and from them to the Arundells in the thirteenth century. The male branch of the Arundell family became extinct on the death of John Arundell in India in 1776, and the estate of Methleigh was sold to the Coode family. After Dr. Coode had lived here for some time it was occupied by the Treweeke family (the oldest Cornish name in the county) who farmed the land until the last of the family died. It was then taken over by a Mr. Mitchell for a short period, who was succeeded, in 1900, by the late Mr. John Richard. The house was renovated towards the end of the nineteenth century. Historians say that in ancient times a chapel existed on the estate, close to Tremearne Farm. The remains of a carved pillar are said to be still in existence and is now used as a gatepost at the farm of Tremearne. See how small the village appears compared to the present day. Fore Street Methodist Church can be seen in the centre whilst St Bartholomew`s Church is just to the right. At the harbour head we have the shipyard complete with covered slipway!